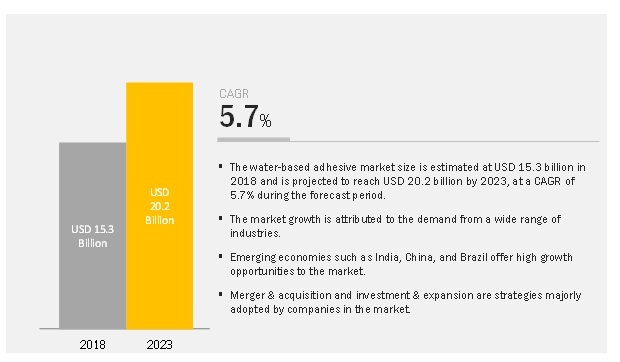 [151 Pages Report] The water-based adhesive market is expected to grow from USD 15.3 billion in 2018 to USD 20.2 billion by 2023, at a CAGR of 5.7% during the forecast period. The study involves four major activities to estimate the current market size for water-based adhesive. The exhaustive secondary research was done to collect information on the market, peer market, and parent market. The next step was to validate these findings, assumptions, and sizing with industry experts across the value chain through primary research. Both top-down and bottom-up approaches were employed to estimate the complete market size. After that, the market breakdown and data triangulation were used to estimate the market size of the segments and subsegments. In the secondary research process, various secondary sources such as Hoovers, Bloomberg BusinessWeek, and Dun & Bradstreet were referred, to identify and collect information for this study. Secondary sources also include annual reports, press releases & investor presentations of companies; white papers; certified publications; articles by recognized authors; gold standard & silver standard websites; food safety organizations; regulatory bodies; trade directories; and databases. The industry’s supply chain and market size, in terms of value, were determined through primary and secondary research. After arriving at the overall market size-using the estimation process explained above-the market was split into several segments and subsegments. In order to complete the overall market engineering process and arrive at the exact statistics of each market segment and subsegment, the data triangulation and market breakdown procedures were employed, wherever applicable. The data was triangulated by studying various factors and trends from both demand and supply sides. Henkel (Germany), H.B. Fuller (US), Arkema (Bostik) (France), and Sika (Switzerland) are the major players of water-based adhesives. This research report categorizes the water-based adhesive market based on resin type, application, and region. 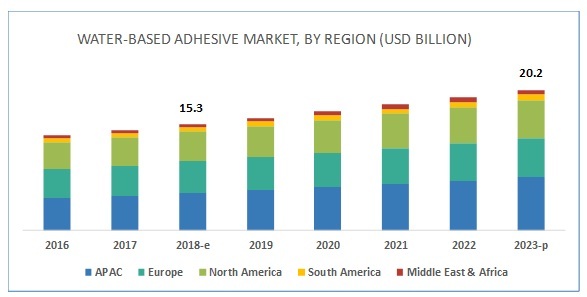 The water-based adhesive market is expected to grow from USD 15.3 billion in 2018 to USD 20.2 billion by 2023, at a CAGR of 5.7% during the forecast period. The growth of several applications such as tapes & labels, paper & packaging, and woodworking is driving the demand for water-based adhesives. The acrylic polymer emulsion segment is estimated to account for the largest market share during the forecast period. Acrylic polymer emulsion is an environmentally friendly adhesive that provides an adequate balance between shear, tack, and peel strength of the bond. It is widely preferred in a variety of packaging applications, such as bookbinding, paper bags, cartons, labels, foils, films, paperboard decals, wood assembly, automobile upholstery, and leather binding. Acrylic polymer emulsion is also used to bond backing material in the automotive industry, as it helps to reduce vibrations in vehicle body panels. The tapes & labels segment is estimated to be the fastest-growing application of water-based adhesive during the forecast period. The demand for water-based adhesives in the tapes & labels application is high due to its use in medium & heavy-duty carton sealing, gift wrapping & decoration, general purpose repair, bundling & strapping, and stationery. Tapes & labels are mainly used in the packaging of electronic and electrical devices, hygiene and medical packaging, packaging of drug delivery system, packaging of construction materials during transit, packaging related to automotive and logistics, and packaging of consumer and industrial goods. Therefore, the packaging adhesive tapes market is witnessing growth, which, in turn, is driving the demand for water-based adhesives. The APAC water-based adhesive market is projected to register the highest CAGR during the forecast period. The APAC water-based adhesive market is segmented into China, Japan, India, South Korea, Thailand, Indonesia, Taiwan, and Rest of APAC. According to the Population Reference Bureau, the fastest-growing consumer markets of China, India, and other APAC countries had a combined population exceeding 4 billion (as of 2016). This large population is projected to become an increasingly important driver for industries such as paper & packaging, woodworking, building & construction, and automotive & transportation over the next two decades. Water-based adhesives have major applications in these industries, which is expected to result in the growth of the market in APAC. Henkel holds the leading position in the water-based adhesive market with its wide range of offering for water-based adhesive products. The company caters to the demand from the automotive & transportation, building & construction, woodworking, electronics, and energy and utilities industries. It focuses on both organic and inorganic growth to increase its production capacity, sales, and market share. For instance, in June 2016, the company launched the Henkel Adhesives Innovation Center (HAIC) in Shanghai, China. This development helped the company expand its R&D capabilities for adhesives and provide innovative market-driven solutions to local customers of APAC. In October 2017, H.B. Fuller acquired Royal Adhesives & Sealants (US). This acquisition provided the customers with a broader portfolio along with expanded development and production capabilities. In June 2016, Henkel Adhesives Innovation Center (HAIC) was launched in Shanghai, China. This development helped the company expand its R&D capabilities for adhesives and provide innovative market-driven solutions to local customers of APAC. In September 2016, Sika opened a new factory for adhesives and acoustic products in Brazil. This expansion helped the company in tapping the future potential of the automotive sector in Latin America by providing stronger, safer, and low-noise vehicles. What are mid- to long-term impact of these developments on the industry? What are the upcoming advancements in water-based adhesive formulations? What are the upcoming applications of water-based adhesives? What are the key trends in various applications of water-based adhesives? Who are the major players in the water-based adhesive market? 10.11.16 Beijing Comens New Materials Co., Ltd.